This year, NC State’s College of Veterinary Medicine is merging global health research with the existing education program to create a single Global Health program. By streamlining these efforts, the new program will unite the strengths of both research faculty and teaching faculty to increase the global impact of the college. We spoke to CVM Dean Paul Lunn to find out more about his vision for the program, and the exciting possibilities that lie ahead. Q1 | Different people define global health in different ways. How do you define global health in the context of the new Global Health Program? Here at the College of Veterinary Medicine, we believe global health is a collaborative, multinational effort to promote health for all. Within the context of our new Global Health program, this means our research and educational programs must take us across borders, where we will interact with other cultures, work in different environments and engage with new, global partners. The purpose of our program is to achieve health for all by combating global health issues in the fields of animal health, human health and environmental sciences. At NC State, we have many strengths in different disciplines, but in this new program we will be strategic and focus our efforts on key areas like infectious disease and food security to ensure we maximize our positive impact on the world. Q2 | Veterinary medicine is fulfilling an increasingly important role in global health, such that global health often merges with One Health. What does this mean to you, and to the program? Global health and One Health are distinct entities, but most of the activities we do at this college, in a global context, have a One Health perspective. One Health is a paradigm that we have been promoting for many years, with the objective of explaining to people the role and value of veterinary medicine in many settings, including global health. 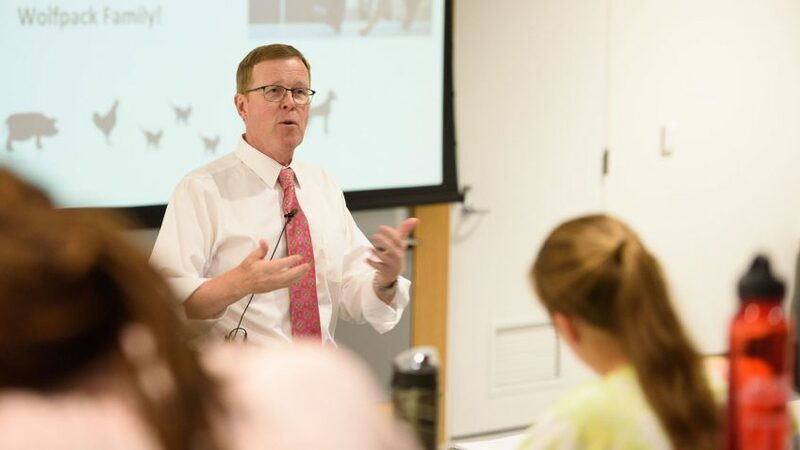 As a world-class veterinary school, we see it as an obligation of our mission to try to solve problems around the world, because veterinary medicine is a vital, central part of impactful global health programs. However, veterinary medicine will never succeed in solving global problems if it works alone — any more than human medicine will. Victory is all about finding the right partners who understand the value of different team members, and building effective coalitions to take these challenges on. From this perspective, our Global Health program will tackle global health using the One Health paradigm to address the complex interrelationships that exist between animal, human and environmental health. Through partnerships with researchers, clinicians and educators from different disciplines, we aim to collectively solve some of the biggest threats we face today. Q3 | Why did you decide to start focusing on global health research? If you look back at our history, it’s clear that this college has aspired to focus on global health, and in fact has been a leader in global health since the day it was founded. Some of our faculty who have retired, like Mike Levy, put an enormous amount of time into creating a program to send students overseas, and many of our current faculty have done global work and collaborated with global partners for many years. However, until now, this effort to conduct global health research has essentially been on a volunteer basis, without central support from this office. So, as we launch this program, this is not the beginning of global health research at this college. Instead, this is a clear, strategic decision to build on the work our faculty have already been doing, to restructure our efforts, and increase our impact in this field. Q4 | What sets this college apart, in terms of our ability to have a positive impact worldwide? First of all, we have access to incredible resources, both inside and outside of the college. Our faculty are recognized experts in major areas of global health, and within the university we have other amazing colleges to partner with. We also have prestigious neighbors, like UNC Gillings School of Global Public Health and Duke University’s Global Health Institute, who are major players in the field. When you’re in an opportunity-rich environment like this, you’ve got an obligation — not just an opportunity — to take advantage of it. Secondly, at this college, one of the things we’ve got real leadership in is educational excellence. Before we created this Global Health program, we strategically launched the Global Health Education program, led by Andy Stringer. Together with his colleagues, he has established a successful program that exposes our students to a global environment and gives them the competencies they need to make a difference in a globally engaged world. Our faculty also participate in educational exchange programs to advance veterinary medicine in other countries. By hosting international faculty and clinicians, we can provide contemporary, competency-based education to people who want to bring new technologies and ideas to their countries. This December, I’m traveling to Senegal with Sid Thakur, Director of Global Health, to try and bring to fruition a One Health educational program that will teach veterinarians, doctors, sociologists, social anthropologists and other students in both Africa and North America. When combined with global health research, this transfer of knowledge between countries represents a wonderful way to promote the mission of veterinary medicine and make a global impact. Q5 | What do you hope to achieve with this program? We can act fairly quickly to achieve a difference in the opportunities we offer in education. When we first launched the Global Health Education program, it was based around improving these educational opportunities, and we are already seeing a big impact on our student community. As we grow our research endeavors and enterprise overseas — China, India, Africa and Central America being the places we already operate in — I look forward to seeing our students and their training programs become a vibrant part of those research programs. Making this happen will depend on our more challenging long-term objective of expanding our global health research. To achieve this, we must increase our resources in the college by continuing to hire new faculty and develop new relationships and funding to generate a sustained impact over time. I think we’ve already found several global partners who are right for our long-term goals, but with Sid Thakur as the new director of the Global Health program, we have a much greater capacity to form more of these partnerships. Establishing a highly productive, impactful program takes time. The really successful programs didn’t get there overnight, but you’ve got to start, and we have.